← Your Communication Team needs you! Video streaming is the technical term for the distribution of presentations over the internet to people who view them on their computer screens. Presentations of this type are called webcasts. Webcasts of church services are now widely available, many of them live. 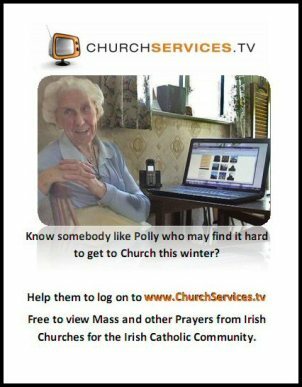 Here in Ireland, Church Services.tv provides live webcasts from a number of churches and cathedrals at all hours of every day. Why would I want to view a webcast of a church service? There is nothing like the real thing, of course. It’s much better to be present at the service than to watch it on television or on a computer – except that you do avoid the collection! But what if you cannot be present because you are ill, or there is no transport, or you are trapped indoors because of severe weather conditions? Perhaps you are on holiday in a strange land or camping on the top of a mountain. Wherever you are you can still hear Mass as long as you have access to a computer and the internet – and you can take a lap-top almost anywhere. Which services are available as webcasts, and when? Church Services.tv provides streaming twenty-four hours a day, seven days a week from thirteen churches. All the services in those churches are available for viewing, including Mass, morning and evening prayer, funerals, weddings, and adoration of the Blessed Sacrament. The Church Services.tv web site gives the dates and times of all the services as well as “What’s on now”. The service is very easy to use. Just visit the Church Services.tv web site by clicking HERE and then click on a picture of a church and you will probably figure it out easily enough. If you think you could have problems you might like to view this explanatory video first (don’t forget to turn your sound on). If you still have problems, send an e-mail to us (the communications team) and we may be able to help you. You can get to us on the Parish Administration ContactsÂ page.